Does your dog go absolutely insane with anxiety every time even the smallest thunderstorm rolls in? Will they whine, yelp and stomp all over you all night keeping you awake or crawling under your bed to the point of becoming stuck there? Most dogs do. Some are perfectly fine with thunderstorms, but many just turn into an inconsolable ball of anxiety. Many dog owners will attempt to bend over backwards to help ease their animals obvious suffering, however they may just be making the issue much worse than it needs to be. However, if you take the appropriate measure you can help calm some of the anxiety that plagues dogs during a thunderstorm. Some dogs will try to crawl behind their owners couch or under their bed and get themselves stuck. Once you are able to fish them out, they just try it again a few seconds later. Dogs feel safer in enclosed environments when they are nervous. They want to be somewhere dark, tight and preferably quiet. If you have noticed that this is the go to behavior that your dog displays during thunderstorms, let them do. However, provide an environment where they will not get stuck, create a safe place for them and as soon as a storm starts, place them in it. A crate with some blankets that smell like them, is a good option. Place it somewhere quiet and insulated from the sounds and sights of the storm. For example, my Jack Russell Pug mix is a small dog that often got stuck under my low sitting bed. Instead, I tried opening my closet door. He went right in and stayed there until he felt safe to come out. Sure he gets fur all over my dirty clothes, but if it makes him feel better then I am fine with it. If you do not have a place that your dog wants to hide, or instead of hiding they just cannot sit still try instead to block the storm out. Turn on a movie, preferably one without a lot of action or explosion and turn it up. Turn it up loud. Place a thick sheet over the windows in a room and shut the door. Be sure to do this quickly when you hear the first rumble of thunder. If your dog does not know it is happening outside, they will not become anxious about it. Do not lock them in the room alone though, that will just serve to make them suspicious and thus anxious. 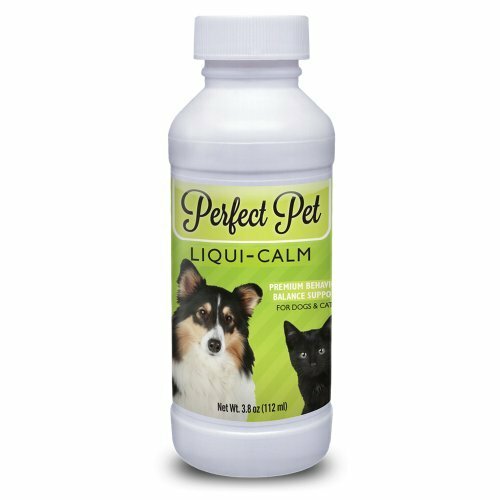 Liqui-Calm Premium Stress Reduction Aid for Dogs & Cats: Liquid Calming Formula Relaxant, Anti Anxiety Relief Supplement with L-Theanine. Helps Control Separation Anxiety & End Destructive Behavior, Calm Thunderstorm Nervousness, Helps Stop Fear in Unfamiliar, Stressful Situations. An All Natural Medication, Made in the USA. With the blocking out the storm method or any other method, it is important they you act like yourself. If you see your dog getting anxious, picking them up, holding them, giving them any more attention than normal makes them suspicious. You are only cementing their fears that something really is wrong and that they should be worrying about it. Kick back and watch some television, read a book, or do some work. However, you should make yourself available if you dog needs some reassuring. Have a lap available for cuddling, be there if they want to get some petting for reassurance. However, let them come to you. Be sure to not respond to their behavior with anger. Sure, it is annoying when dogs get stuck somewhere or will not sit still or be quiet. It is just their way, though. Don't yell, scold, or hit them for any of their behavior during a thunderstorm. Be calm and be available if they need you. Some dogs will just refuse to be distracted during a thunderstorm, particularly the smarter breeds. However, if a thunderstorm is coming, try playing a game until they are tired. The dog will be distracted by the game and tired after it ends. However, this doesn't work with some of the louder storms. If you know a thunderstorm is coming a few hours ahead of time, make an effort to wear your dog out. Take them for a long walk, play a long game of fetch several times throughout the day, things like that. If it is a flashy thunderstorm with some quieter thunder, you will find your dog will sleep right through it. My veterinarian told me to try giving my Jack Russell Pug mix a half of a children's Benadryl during bad thunderstorms, as the stress gave him hives. You can do this with your dogs as well. However, I stopped as it made my dog particularly groggy the next day. Instead, try to procure some dog pheromones that encourage calmness. Dogs respond extremely well to smells and companies can now product a dog pheromone that can help alleviate anxiety. If your dog hides in an aforementioned crate or closet, try spraying it in there or on a blanket. This will help cement that the area is a safe place for them. Starting early refers to two things. Start these anxiety fighting remedies early during a storm and start conditioning your dog early in their life. Many dog owners know that dogs get freaked out during thunderstorms, so when they get a new puppy they unconsciously condition nervous behavior during them. Owners will be woken up by a storm in the middle of the night, and wake up their sleeping puppy to make sure they are okay. They will start to make the connection between your nervousness and the noise of the storm. Thus the behavior follows them throughout their life. However, if your puppy is freaked out, by all means practice some of the calming behavior above. It is much easier to train a puppy that a crate in a closet or just a closet in general is a safe place rather than a grown dog. So if your puppy shows signs of anxiety during a storm, make sure you pick a calming method and stick with it. What a smart article - well placed ads, you should do well with it. Valium for dogs, crazy. Nice, so many dog are terrified of thunder.